Is your air conditioning system making noise? If the answer is in the affirmative, then this article is for you. Air conditioners more often than not use fan to distribute the cooling air to various part of buildings or vehicle with the aim of improving the quality of indoor air. At any point that it starts becoming noisy, it is important that you fix the noise before the situation exacerbates. Air conditioning systems are prone to make different kinds of unpleasant noise such as clicking, grinding, chirping, tweeting, squealing, and humming. Clicking and ticking sounds: Whenever you ac make a ticking or clicking sounds, it implies that some components within it are not working properly. Clicking or ticking sounds are mostly associated with the electrical fault. At this point, if you do not have experience dealing with electricity, your best bet would be to seek the services of an electrician. Rattling and squealing sounds : If your air conditioner makes sounds that are similar to squealing or rattling, it suggests that there could be problems with the outdoor fan. Similarly, this type of sound could suggest that there are external particles such as a stick, leaf, twig, or a branch. These foreign particles more often than not fall on the outdoor unit of the air conditioner and could lead to these noises. In addition, debris like rocks, toys, and mulch can also be responsible for these noises if they get inside the AC compartment. It is advisable to seek the air conditioning repair services of a technician to rectify the fault. Technicians are trained and certified to overhaul any defective part of it. TWEETING OR CHIRPING NOISES: If your air conditioning system makes a sound that is similar to that of a bird, then you need not fret, especially if the unit has been redundant for a while. Air conditioners are designed to make chirping sounds at first start when it has been redundant for a while. Upon startup, different parts of the unit need to warm up, hence the chirping sound. However, if the chirping sounds continue without reduction, then there is something definitely wrong with the system. At that point, you need to seek the help of a professional. GRINDING OR HUMMING NOISES: If you observe your unit system making grinding or humming noise, then there is every possibility that the unit needs lubrication. Usually, the motor in an air conditioner is designed to make a humming sound. If this is the situation, it is an insignificant threat to the AC unit. Some of them come with an unsealed motor. It is a good practice to regularly lubricate your AC’s motor, especially at the beginning of summer. Example of lubricating oil to apply is the SEA 10. Air conditioners can generate other types of noise. A central AC, for instance, can generate noise whenever there is a problem with its condenser. Rectifying these problems require a proper understanding of the workings of an air conditioner. It is advisable to seek the services of a professional. 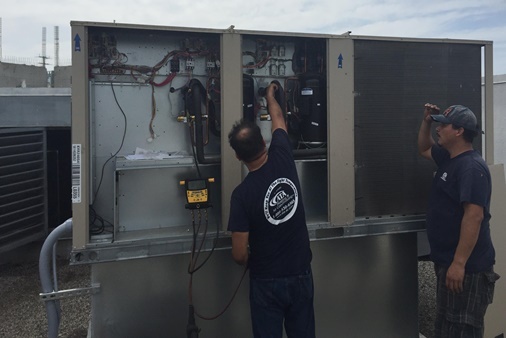 However, if your AC unit is old, then you need to consider replacing the entire unit.